The ruling body for Muslims in Russia, the Council of Mutfis of Russia, is urging its followers to be loyal to the state. 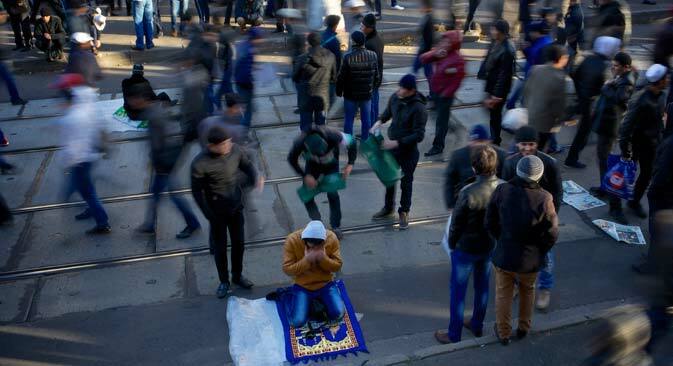 A new social doctrine adopted by Russia's top Islamic clerics defines the place and role of Muslims in the country's life within both religious and secular laws. Patriotism and loyalty are at the heart of the new doctrine. A number of experts, from the council as well leading theologians, religious scholars and academics, have drafted the new doctrine, adopted by the Council of Muftis of Russia on May 27. It combines recommendations to Muslims on a wide range of issues, from attitudes to the state to everyday matters. The provisions of the doctrine are supported both by Muslim sources, the Koran and Sunnahs (teachings and practices of the Islamic prophet Muhammad) and by Russia’s secular laws. The doctrine effectively outlines the views of Muslim theologians that are loyal to the current authorities on what a true Muslim should be like. Firstly, a true believer must be a patriot. “Love for one’s motherland is not only acceptable but is essential from the point of view of teachings of Islam,” the doctrine says. This covers not only patriotic sentiments but also compliance with the law. It is prescribed that a Muslim assumes obligations of the social contract envisaged in the constitution. A Muslim should also be a peace-loving person: the doctrine says that every effort should be made to avoid war as a form of jihad. A military jihad can be carried out only if ordered by a lawful ruler. Khayretdinov pointed out that many young Muslims, including those from Russia, have become influenced by extremists and some have even travelled to the Middle East and joined terrorist groups there. One of the main tasks of the new doctrine is to keep the young generation within traditional Islam, he added. The doctrine will officially come into force in June, after it is signed by the country’s three main Muslim organizations (muftiates). Damir Khayretdinov predicts that the Muslim population will respect the document. Varvara Pakhomenko, an expert in Caucasian affairs and a consultant with the International Crisis Group, told RBTH that the authority of the theologians behind this doctrine is not absolute for all Muslims. Another weakness in the doctrine, according to Pakhomenko, is its focus on “traditional Islam” as a pillar of Russian statehood. Thus supporters of more radical movements are excluded from the dialogue between the authorities and the Muslim community.